1 Unplug the saw's power cord from the electrical outlet or extension cord. 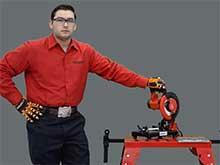 2 Press down on the saw's arbor-lock button and rotate the blade until the locking mechanism engages. 3 Use the blade wrench to remove the arbor nut holding the blade in place. To loosen the nut, turn the wrench in the same direction as the blade cuts. 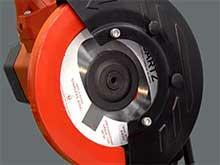 4 Retract the saw's upper blade guard and remove the old blade. 5 Slip the new blade onto the saw's arbor, making sure the saw teeth face in the direction of rotation. 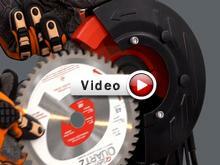 If you're unsure, refer to the arrow on the saw's blade guard. 6 Use the blade wrench to tighten the arbor nut until it's snug; be careful not to over-tighten the nut or it'll be difficult to loosen it the next time you change the blade.